Some people would argue that white is a traditional color for a kitchen, but others would argue that yellow or beige were just as traditional. One thing cannot be denied, though. 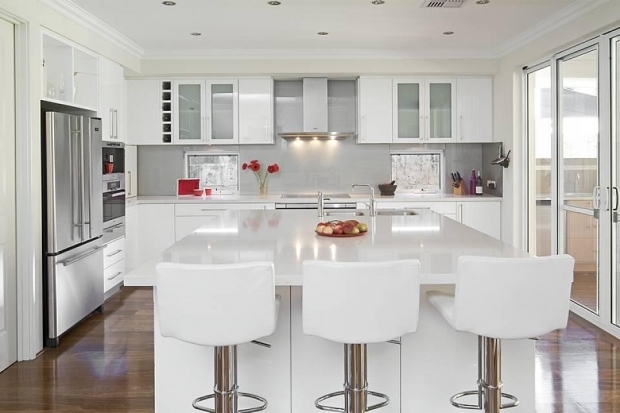 If you have white walls, white counters, white large appliances, and white small kitchen appliances, you have a very clean looking kitchen. It definitely shows if anything is not as clean as it should be. 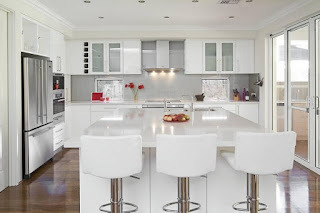 A good thing about white kitchens, though, is that if you decide you want some color, the addition of colorful dishes, cookware, bake ware, or even cookie jars or canisters can liven it up. And if you get tired of one color or theme, such as a sunflower or rooster theme, you can easily change to another. if you decide you want some color! In many cultures, white is the color of purity. Brides often wear white, because white symbolizes virginity; at the same time white is worn in some countries at funerals. Some sources say white is the color of kindness, and white daisies are a representation of faithful love. Because white light is whole, a complete combination of all colors and not a true color in itself, it sometimes denotes openness and truth. However, as anyone who has been in a hospital might realize, white is also cold and stark, especially if it is not accented with vibrant colors such as yellow. White can denote new beginnings and opportunities for explosive development. It can help bring clarity to mental confusion, and helps to clear away cobwebs and clutter in the mind. Over the next few weeks, I will be featuring color themes for kitchen décor, including turquoise, purple, and pink, as well as the more common yellow, blue, green, grey, black, and copper.